The SA [Sturmabteilung or Storm Detachment] played a central role in the construction of Hitler's dictatorship. As the paramilitary wing of the NSDAP, it used the most brutal means to attack political opponents and critics of the Nazi regime. SA men (also known as Brownshirts) led the charge to take political control of the country through brute force exerted from the bottom up. But in the summer of 1933, Hitler decided on a change of course. He declared that the National Socialist revolution was over and sought to stabilize his dictatorship by normalizing relationships with traditional authorities in the state, the economy, and the military. The SA thus lost its leading role in the areas of agitation and force without being assigned a new one. Chief of Staff Ernst Röhm and other SA leaders increased their calls for a "second revolution," criticized the party and military leadership, and hoped that the SA, as a national militia, might even replace the army. The organization, which was more than 4 million strong in the spring of 1934, would not willingly subordinate itself. On June 21, 1934, in view of escalating SA street violence, Reich President Hindenburg threatened to declare a state of emergency and to impose martial law if Hitler failed to gain control over Röhm’s organization. Thereupon Hitler authorized preparations for “Operation Hummingbird,” which was to be carried out by the SS [Schutzstaffel or Protection Squadrons], the SD [Sicherheitsdienst or Security Service], and the Gestapo. From June 30- July 2, 1934, the SA leadership was violently liquidated by means of mass arrests and shootings. As part of a parallel operation, the Nazi regime also eliminated other political opponents, including Edgar J. Jung and Herbert von Bose, both of whom had been assistants to Vice Chancellor Franz von Papen, as well as former Reich Chancellor Kurt von Schleicher and his wife. 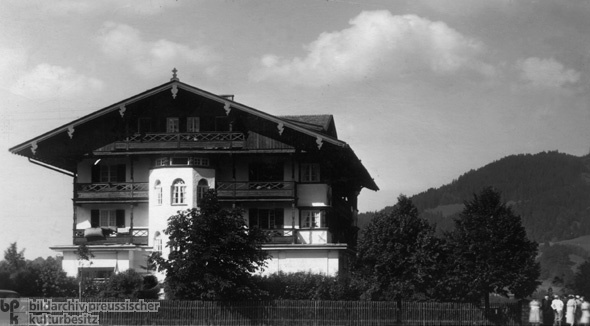 Hitler was present when Röhm and other SA leaders were arrested at the Hanselbauer Hotel in the Bavarian town of Bad Wiessee. Röhm was shot to death on July 1, 1934. Photo by Ostermann.